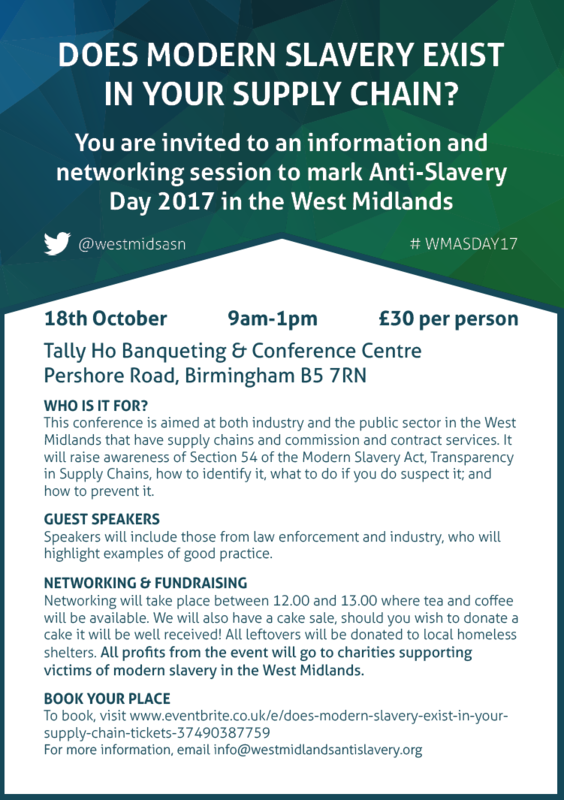 The West Midlands Anti Slavery Network and Partners are holding a conference on Anti Slavery Day – 18th October 2017. It will take place from 09.00hrs – 13.00hrs with excellent speakers with a wealth of knowledge from all three sectors and finishes with networking and tea, coffee and cakes. If you would like to know more about the legislation (Section 54 Modern Slavery Act), how to identify and prevent trafficking in your supply chains, who to contact and how they can help you, then this is a must for you and your organisation. It is aimed at Industry, Businesses and the Public Sector who have supply chains, commission services and employ subcontractors. This will be in the leisure industry, construction, food and agricultural industry, clothing and design, cleaning services, building trade, Health and NHS, Law Enforcement, Local Authorities and many others. All profits will be donated to local charities providing services to victims of Modern Slavery in the West Midlands.